Well, he didn't portray us as a bunch of mouth-breathing neckbeards, but he sure comes across as an avid cheerleader for Fiat. I sent him a lengthy e-mail explaining why I think the new "Gladiator" is a mistake, and something that no true Jeeper would want anything to do with. He managed to make it sound like I think the new "Gladiator" is the greatest thing since sliced bread. He used something I said about the Comanche and made it seem that I said that about the 'Gladiator." This article is basically just an advertisement for the "Gladiator." A guy I once worked for used to say, "Everything you see in print is true ... unless you have first-hand knowledge of the facts." Quod erat demonstandum. That's all articles are these days are ads. I don't trust much of anything in articles anymore, especially if there is a product involved. I'm a little surprised he didn't mention a little more about your Jeeps or talk about your role in the Comanche community to increase credibility in your quote. That paragraph with your quote just felt forced in a weird way. He really just picked what he wanted to hear from what you said because that's how most reporters/journalists work these days. They would fit right in with politicians..
yup, it's more or less what we thought would happen, just not as bad as we'd feared. still, that's pretty ballsy to take teh words of a guy who clearly hates the gladiator and make it sounds like he can't get enough of it. That is not right that he took your opinion and completely changed it-he asked your opinion and made it different. Yes, that's exactly what he did. 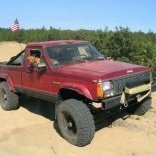 I did write to him that “Nobody but Jeep had ever conceived of a vehicle like this.” The problem is, I very clearly said that about the Comanche, NOT about the new "Gladiator." He didn't misquote me, but this is an egregious example of taking a quote completely out of context. Actually I have a lot to say but I'll save it. I'm a news junkie, always have been. I've been listening 'news radio' and to 'talk radio' before talk was Talk. I spent my evenings in front of the boobtube watching 'news'. Seven years ago I could no longer accept the fact that I was being lied to, I kicked the TV to the curb, "TV" is not and will never again be invited into my home. After I kicked the boobtube habit I took to reading news articles, everyday I read 3-4 hours, for years. Anymore I can scan an entire article in seconds. If I cared about syntax and punctuation...........I could have written a better article, for sure. I have not read it nor do I need to. I have no respect for anyone in the media, any media, human debris, pure scum. The writer is just another idiot with an agenda, he's too stupid to know the difference between MJ people and FSJ people. Reading it.. It was clear, you didn't care for the Gladiator. I thought the quote wasn't contextually used well, but when you include the article structure, I.E. the quote being in the first paragraph and the tone of the second paragraph being negative, it reads much clearer as the quote was intended to highlight Jeep's former innovation vs. the current repackaging marketing focus. I may have to read some of the author's other writing to see if this a trend for him to leave quotes missing context. I complained to Bloomberg's editors about the way Mr. Stock had twisted my words to convey exactly the opposite impression from what I actually said. I received an e-mail from Bloomberg informing me that the article has been revised to more accurately reflect my thoughts. I'm surprised they changed it at all, but to go completely the other way with it is kinda crazy to me. Sounds much better now and definitely not a forced quote anymore. I missed the original article. I read the first one and was like, this doesn't sound bad at all. Then read the new article and realized it was the same one. I was all kinds of confused for about 5 minutes! Well, then I read the edited version as this links the version I read. The biggest hurdle will be the cost. Also, I think the largest segment of buyers won’t be “Jeep” people. It’ll be the same people that buy the 4 door unlimited and lift it without any intention of ever taking it off road. Agreed. It will be people who think they want a Jeep, without knowing or understanding what Jeep is all about. It’ll be the same people that buy the 4 door unlimited and lift it without any intention of ever taking it off road. Yeah, the parking lot cowboys who need the lift so they can park on the grass islands at the local mall parking lot.